This map takes all existing, approved and proposed projects and juxtaposes them with the urban footprints of large metropolitan Albertan areas Edmonton and Calgary (both cities well in excess of one million population and with vast urban sprawl development). This map includes projects that have been proposed but not yet given approval (as of July, 2008). 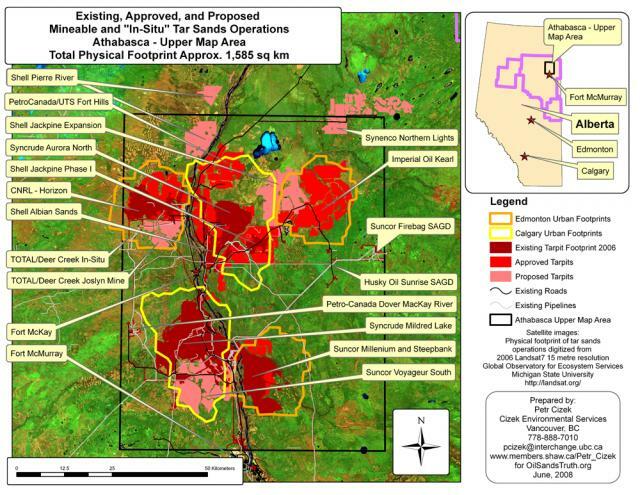 In pink are tar sands projects not yet approved but drawn up and conceptualized for proposal, light red areas already leased and approved for development but not yet developed, and dark red areas for existing footprints under continual development. Calgary's urban footprint outlined in brighter yellow, Edmonton's urban footprint outlined in orange. The physical footprint of existing open pit mining projects is about the same size as Calgary. The physical footprint of existing and approved projects would be about twice the size of Calgary. The physical footprint of existing, approved, and proposed projects would be about three times the size of Calgary.